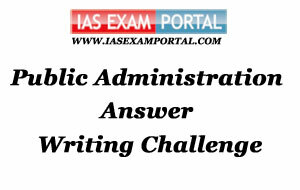 Weekly Mains Exam 2016 Answer Writing Challenge - Public Administration "MODULE- 60" | IAS EXAM PORTAL - India's Largest Community for UPSC Exam Aspirants. Weekly Mains Exam 2016 Answer Writing Challenge - Public Administration "MODULE- 60"
Public Administration- Paper I "Syllabus Topic – Comparative Public Administration: Riggsian models and their critique"
Q1. Prismatic society is defined in terms of three characteristics - heterogeneity, formalism and overlapping. Explain. Fred W Riggs,renowned comparitivist scholar wanted to analyse and compare different administrative systems. His models were based on 3 approaches namely-ideal type,structural-functinal and ecological. Owing to the failure of his agraria-industraia model being abstract & too general which could not satisfactorily explain transitional and mixed economies, a new model came up - fused-prismattic-diffracted after abandoning the prior one which was also based on structural-functional approach. While a society w/o specific functional rules of administrative structures corresponded to a "fused society",a "diffracted society" on the other hand was characterised by highly functional specific structures.b/w these two polar societies lies the "prismatic society" . It is important to mention that prismatic society does not correspond to developing countries but helps in better understanding of developing countries.a prismatic society is characterised by heterogeneity, formalism and overlapping. 1) HETEROGENEITY: refers to presence of different kinds of systems, practices ,opinions, coexistence of urban and rural areas with their fundamental traits,existence of modern(bureau) and traditional structures(courts) and this heterogenity applies both to society and administration. 2) FORMALISM: means discrepancy b/w what is prescribed by rules and regulations and what is actually followed on ground. Official actions not corresponding to their legal entitlements and privleges,intra bureaucracy policy,ritualisation of procedures(red tapism).all this leads to corruption. 3) OVERLAPPING: Mainly on account of heterogeneity of structures,values and functions. While new structures prevail old structures continue to dominate. the bazar canteen model, where prices are not only affected by market forces of demand and supply but also by social & political relationship b/w buyers and sellers is another example. The above mentioned characterstics can be substantiated by the "sala" model too which outlines strict bureaucratic way of functioning leading to the heterogeneity-overlapping-formalism triology. Indian Administration- Paper II "Syllabus Topic – Rural Development : Institutions and agencies since independence"
Q2. The role, functions and effectiveness of voluntary agencies is constrained by several factors. Discuss with appropriate examples from your surroundings.